Nestled among the sea oats in the Cherry Grove section of North Myrtle Beach, South Carolina is Grand Strand Resort I, an oceanfront North Myrtle Beach resort. This small North Myrtle Beach resort is just a few blocks from the Cherry Grove Fishing Pier and three blocks from Sea Mountain Highway, which leads right out to Highway 17, the gateway to all things North Myrtle Beach, South Carolina. Enjoy a North Myrtle Beach vacation at the oceanfront accommodations offered at Grand Strand Resort I. 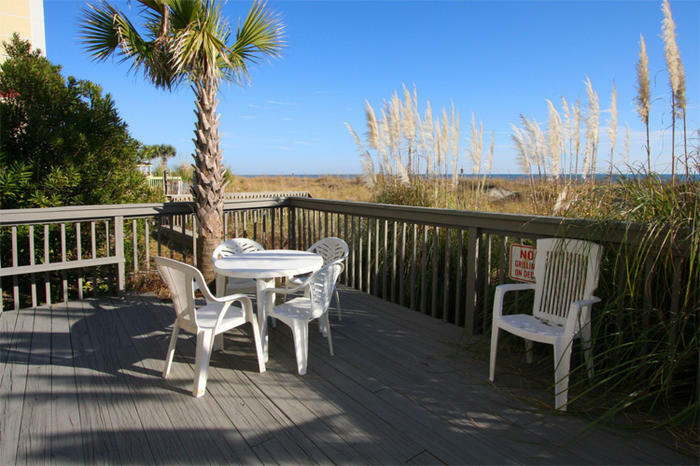 Each North Myrtle Beach rental at this North Myrtle Beach resort has stupendous oceanfront views. Wake up each morning and look of your large sliding glass door to the Atlantic Ocean and white sandy beaches. What an inspiring way to start your North Myrtle Beach vacation day. Grand Strand Resort I is a three-story North Myrtle Beach resort with only three North Myrtle Beach condominiums per floor. This North Myrtle Beach condo complex is a charming destination for your next beach vacation and it is one that is conveniently located near all of the fantastic North Myrtle Beach amusements and attractions. How about a one-bedroom, one-bath condominium in North Myrtle Beach, South Carolina that sleeps six people? Grand Strand Resort I offers such accommodations on the oceanfront. These affordable North Myrtle Beach vacation rentals give you quick and easy access to the beautiful beachfront during your North Myrtle Beach vacation. Unpack your bags and relax in the living area of this North Myrtle Beach condominium or enjoy a snack at the dining table before going outside to soak in the sun. The North Myrtle Beach rentals at Grand Strand Resort I boast a television and DVD player in the living room and another television and DVD player in the bedroom. Sleeping arrangements for six include two beds in the private bedroom, which sleep a total of four people, and two more people on the sleeper sofa in the oceanfront living room. Set your alarm clocks and get up early during your North Myrtle Beach vacation so you can see the oceanfront sunrise. When you are guests at Grand Strand Resort I for your family beach vacation you have the choice of watching a glorious sunrise from the oceanfront sun deck or going out to the white sandy beaches and watching the sun come up while you relax on a beach towel or a beach chair. Take with you a cup of hot coffee and a camera because this early-morning show is worthy of a photograph! Elliott Beach Rentals is not affiliated with onsite management or the HOA of Grand Strand Resort I.